18 May, Walter Ulyate Max Sisulu is born in Engcobo District in the Transkei, in the same year, the ANC was formed. Walter returns from his aunt Agnes’ home at Cofimvaba, Transkei, about 30 miles from his mother’s home at Qutubeni. For a long time during his early life, Walter’s mother Alice had to work away from home. Walter tended cattle, sheep and goats like any peasant youth. Walter is exposed to a mediated version of Marcus Garvey’s Pan-African liberation for black people via village meetings arranged by Wellington Buthelezi, a visiting Natalian who assumed an American identity. Sisulu leaves school at the age of 15. His mother works in faraway East London, and Dyantyi Hlakula, a family figure who was a point of identity and stability for Walter, dies. At the age of 16, Walter uses an older cousin’s identity to be accepted as a migrant labourer by the mine recruitment office. Sisulu travels 1000 kilometres to Johannesburg by train, only to be judged too young for underground work on his arrival. A compromise is struck where he is released from his contract by a relative, and works for a dairy farmer delivering milk to the mine. he attends various educational organizations. He later became secretary of the "Orlando Brotherly Society", a Xhosa organization, which prompted an interest in tribal history and encouraged economic independence from whites. After a quarrel he is beaten badly by his employer, and on reporting it to the police, receives further abuse. Other jobs as domestic worker, dormitory sweeper follow. Tired of city life, Walter returns home and once back in the Transkei, undergoes a traditional Xhosa initiation rite. Again a migrant, Walter returns to Johannesburg to reluctantly work 9 hour days loading ore underground in a gold mine. After a cave-in killed several miners in the shaft which he usually worked, a depressed Walter was transferred above ground. A strike threat over poor conditions led to concessions, and Walter has his first experience of organized industrial action. At mid-year, some time after his 120-day contract expires, Walter returns home to the Transkei. Finding domestic work in a liberal household in East London, Walter vainly attempts to meet the ANC’s founder, Walter Rubusana. Also influenced politically by Booker T Washington’s Up from Slavery, and culturally by the writing of WEB du Bois. Sisulu returns again to his village, Qutubeni, delivering a parcel to the son of a white stranger he met in East London. Typically, he is received with disdain by the recipient, a white pharmacist. Returning to Doornfontein, Johannesburg and staying with his washerwoman mother, Walter finds work at a bakery. Unbeknown to Sisulu at the time, a neighbour is Joe Slovo. Attends night school at the Bantu Men’s Social Club and takes driving lessons, getting to know the city better. The Slum Clearance Act affects Walter and his mother, amongst thousands of Black inner-city residents. He is forced to move to Orlando, which is later part of Soweto. Conditions are far from the promises made by the local government. Walter initiates a higher wage strike at Premier Milling Company, which is dissolved and he leaves. Suffers pass book and other police harassment and resolves to “suffer under the system until I have defeated it”. Works temporarily at Bantu World, a newspaper run by Selope Thema, a founder member of the ANC and a fine journalist. Also finds various clerical jobs, including with the Johannesburg municipality enumerating the population census. Finds employment at Union Bank of South Africa as a marketing agent, persuading potential clients to open accounts. This affords him contact with a wide range of people. By chance he has contact with Communist Party member Rusty Bernstein, who loans him the first piece of left literature which Walter read, Stalin’s 1913 article on the National Question. Meets Govan Mbeki, then a student at Fort Hare, after reading his The Making of the Transkei, and also Kaizer Matanzima, the Thembu chief. After putting himself through school while working as a houseboy, Sisulu starts working as an estate agent. He is formally recruited into the ANC by trade unionist Alfred Mbele. At the centre of ANC affairs from this year until arrest his arrest for suspected treason in1963 in Rivonia. Mandela and Sisulu first meet, at Walter’s office. Having avoided an arranged marriage in the Transkei, Mandela is in Johannesburg, finding his feet. Sisulu helps him find a job in his chosen career, law. December, Meets Pixley Seme, one of the founding members of the ANC, on a train bound for the ANC annual conference in Bloemfontein. Again attends the ANC annual conference, at which the organization is modernized, abolishing the House of Chiefs, the branch is elevated as a basic unit of the organization, full equality extended to women members and the women’s section is formed. 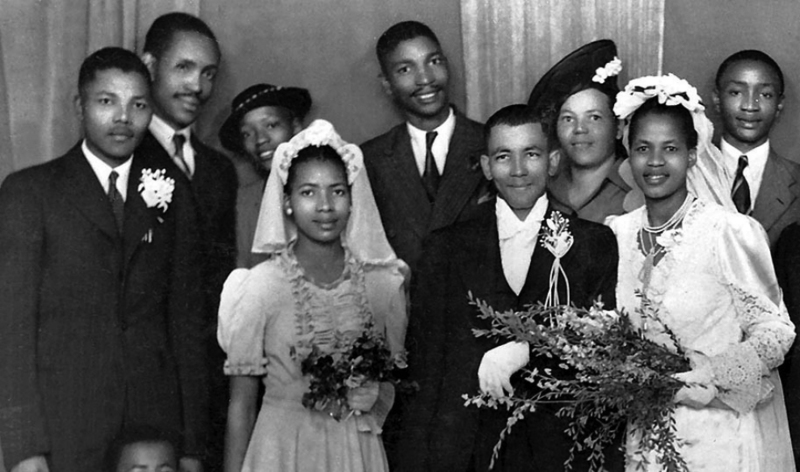 15 July, Walter and Albertina Sisulu were married on 15 July 1944 in a civil ceremony at Cofimvaba in the Transkei. Anton Lembede warns Albertina that she is marrying a man who is already married to the nation. 17 July, The wedding was followed by a reception at the Bantu Men's Social Centre in Johannesburg on 17 July. 11 September, With Nelson Mandela, Walter is the co-founder of the ANC Youth League, and is appointed its Treasurer. While the mass action of the African Miner’s strike is brutally suppressed during a meeting between the Native Representative Council and Smuts, Walter and the ANC YL become impatient with the “toy telephone” of the NRC. The ANC Youth League decides to actively support the strikers. Walter plays a key role in re-shaping the ANC after WW2. The election victory of the Nationalist government precludes democracy and Walter and other ANC members seek new ways to fight injustice and oppression. Appointed the first full-time Secretary General of the ANC, a position he held from 1949 to1954. At the same congress, the military Programme of Action was adopted. This would become a major impetus to transforming the ANC from a reactive, protest movement to a mass organization. It was at this shift in South African history that Sisulu led his political home. January, The ANC, together with its alliance parties, initiates the Defiance Campaign. "South Africa Behind Bars" a text prepared by Sisulu, is handed out among the representatives of the different countries during the session of the U.N.O. May, At a Johannesburg congress of the ANC, African People's Organization, South African Indian Congress and the Communist Party of South Africa, Sisulu is chosen to act as secretary and organizer of the National Protest Committee together with Y.A. Cachalia. They have to see to it that the resolution made at the congress is implemented, namely that all non-whites were to stay away from their work on 26 June 1950. 18 June, Sisulu addresses a meeting at New Brighton, Port Elizabeth and tells the blacks about the decision that everyone should stay away from their work on 26 June 1950 as a sign of protest against the "Notorious Bill of the Malan Government". 20 August, Sisulu officiates as speaker in a meeting which is held in Lady Selborne, a non-white township in Pretoria. 30 September - 2 october, Sisulu speaks at the congress of the Transvaal branch of the ANC, held at Springs. 6 December, Sisulu acts as one of the speakers at a meeting of the South African Peace Movement in the Ambagsaal, Johannesburg. The other speakers are Dr. Dadoo and Michael Harmel. March, Sisulu is in contact with the secretary of the National Council for Nigeria and the Cameroon in Accra. 29 July, Sisulu attends a secret meeting of representatives of the ANC and South African Indian Congress in Johannesburg. At this meeting it is decided that the second phase of the resistance campaign will commence during 1952. An ultimatum has to be addressed to the Government to repeal all discriminating Legislation before or/on 29 February 1952, and if this does not take place a mass contravention of such Legislation will be launched in all sections of the country. The date upon which the campaign will begin is set for 6 April 1952 so that it can coincide with the beginning of the Van Riebeeck festival. December, Sisulu, Dr. Dadoo, J.J. Marks and Y.A. Cachalia (all members of the Joint Planning Council) together with R.T. Chari, former secretary of the Indian High Commissioner in the Union, visit Basutoland. They have discussions there with black headmen about the inauguration of the Protectorate by the Union. Sisulu travels through the country to organise for the resistance campaign and addresses numerous meetings. Among others, Sisulu visits Bloemfontein, Kimberley, Cape Town and Port Elizabeth. Sisulu elected with Yusuf Cachalia (TIC) as joint secretary of the national Action Council that courted volunteers for the Defiance Campaign. Walter partners with Nana Sitha as leader of the Defiance Campaign, which saw 8500 volunteers sent to prison. 6 April, Sisulu is one of the speakers for a meeting which is described as a "People's Protest Day Rally" and outlines the "Plan of Action". The following people also officiate as speakers, Dr. Y.M. Dadoo, D. Ilsome, James Phillips, Moses Kotane and D. Bopape. 21 April, Sisulu, Dr. Y.M. Dadoo, A.M. Dadoo and Y.A. Cachalia are detained at Idutywa in the Transkei, because they entered the area without the necessary permission. 9 June, Sisulu speaks at a meeting of the ANC and South African Indian Congress in Johannesburg. 12 August, Sisulu and others are arrested on a charge under the Suppression of Communism Act. 2 December, For continuing to organize, Sisulu is convicted a second time and sentenced to 9 months imprisonment, conditionally for suspended for 3 years. He risked 10 years in prison. 17 December, Sisulu is served a notification, in terms of section 9 of the Suppression of Communism Act, whereby Sisulu is prohibited, for a period of six months, from attending any meeting in the union. 15 July, Sisulu and P.P.D. Nokwe, a former teacher and member of the ANC, go overseas under false names and without passports. 21 July, Sisulu and Nokwe arrive in London, England. From there they go to Bucharest, Romania, where they attend the communist "World Festival of Youth and Students for Peace and Friendship". After this Sisulu and Nokwe embark on an extensive tour through the countries behind the iron curtain as guests of the Communists. Sisulu and Nokwe travel through Czechoslovakia, Poland, Russia and Communist China. December, After an absence of five months, Sisulu and Nokwe return to the Union. 18-20 December, Sisulu attends the 41st annual conference of the ANC at Queenstown. Here it is decided to begin with the boycott campaign. 6 February, Sisulu addresses an ANC meeting in Durban and gives a comprehensive account of his travel through Russia and Communist China. 11 March, Sisulu addresses an ANC meeting in Port Elizabeth. Sisulu talks in detail about his trip to Europe and of everything he saw and experienced there. 19 March, Sisulu flies to Durban, to discuss the possibility of extending the boycott campaign to Natal with ANC leaders. 28 March, Sisulu acts as speaker during a meeting of the ANC at Veeplaats. Sisulu speaks of the successes of the strikes and the co-operation of the black community in this connection. 1 April, Sisulu addresses a meeting of the ANC in Cradock. 4 April, Sisulu addresses a meeting in Queenstown. 11 April, Sisulu acts as speaker at a meeting of the ANC in Sophiatown, Johannesburg. Sisulu urges the blacks not to allow themselves to be removed from the Western areas. 1 May, Sisulu acts as speaker at an ANC meeting in the Alexandra Township area, Johannesburg. The same day Sisulu also addresses a meeting under cover of the Transvaal Council of Non-European Trade Unions in the Ambagsaal, Johannesburg. 9 May, Sisulu makes the following statement at an ANC meeting in Newclare, Johannesburg, "We are educated people, the Nationalist and United Party Leaders can come and take lessons from us", as well as ,"the white people's time has expired. The Africans are now going to rule. We are not going to Meadowlands". 20 June, Sisulu attends the annual conference of the ANC branch of the Cape Province at Uitenhage. Sisulu officiates as secretary of the "National Action Council of the Congress of the People". 26-27 June, Sisulu speaks at the meeting of the ANC in the Communal Hall in the Western black township area of Johannesburg. Among others, Sisulu said the following, "We need 5 000 volunteers but we must get them before the removal of the "black spots" begins, they must then be ready. 11 July, Sisulu attends a massive meeting of the ANC in Sophiatown, Johannesburg. 23 July, Sisulu is served two notifications, in terms of Section 5 of the Suppression of Communism Act (Act 44 of 1950). Sisulu is herewith commanded to resign as member, official or office-bearer from certain organisations and not to take part again in the activities thereof, and is also prohibited from attending any gathering at any place within the Union of South Africa or the area South West, for a period of two years. 24 July, Sisulu is taken into custody in the Bochabella location, Bloemfontein, on a charge under the Suppression of Communism Act. Sisulu attends a gathering there in spite of the notice that had been served on him. 26 July, Sisulu appears before the Magistrate in Bloemfontein and is released on £50 bail. The case would serve before the Supreme Court Bloemfontein during August 1955. 14 August, Sisulu attends a secret ANC meeting in Durban. This meeting is held during a conference of the "Congress of the People" which is held over the weekend 13 - 16 August 1954. 20 August, Sisulu sends a statement to the different branches of the ANC in which he vehemently attacks the present government over the restrictions that have been placed upon him and others. Sisulu also requests that all the left-wing organizations intensify their propaganda. September, Sisulu approaches a number of prominent organisations in the USA for funds for the "Campaign Plan" as a representative of the National Action Council of the Congress of the People. 11 December, Sisulu, together with a number of members from the T.I.C. and ANC, meet in the offices of the ANC in order to give certain instructions to delegates to the ANC conference, which will be held at Pinetown. 22 April, Sisulu holds an interview with prominent members of the ANC over the boycotting of schools. 6 June, Sisulu, together with a number of listed persons and members of the ANC, attend a secret meeting where plans are discussed to persuade members of the Residents Committee and Native Advisory Boards to join the ANC. 26 June, Sisulu witnesses Congress of the People in Kliptown, not far from his home. Because of a banning order, he has to remain on the outskirts of the historic meeting. Here the Freedom Charter is read to the 2884 delegates. August, An article by Sisulu appears in the pamphlet Workers Unity under the heading "The Allegiance of the Trade Union and Liberatory movements in Africa" in which Sisulu describes the oppression of the mass (non-whites) under imperialism. Sisulu is recruited into the South African Communist Party (SACP). He later becomes member of the party's central committee. September, During one of the most widespread raids on homes and offices in South African history, Walter is one of the 500 accosted in their homes. 1-2 October, Sisulu attends a function in Orlando in honour of Lillian Ngoyi, recently returned from Russia. December, Sisulu is arrested on a charge of High Treason.The trial continues until 1961. 4 October, Sisulu attends an ANC meeting in the Congress Offices in Johannesburg. 18 October, Sisulu attends an ANC Regional conference in the congress offices in Johannesburg. 23 October, Sisulu attends an ANC meeting in the Congress Offices in Johannesburg. 11 April, Sisulu attends a meeting of the National Consultative Committee in the Congress offices in Johannesburg. The boycott of certain goods and activities on 26 June 1959 inter alia, was discussed. 11-19 April, Sisulu is one of the organisers of the "African Rag" celebrations at the Witwatersrand. 23 May, Sisulu attends a secret meeting of the ANC Youth League in Johannesburg. 6 June, Sisulu attends a secret meeting of the United Executive Committee (Congresses), in Johannesburg. This meeting is also attended by Alfred Mahlangu. 20 June, Sisulu attends a secret meeting of the National Consultative Committee (ANC). 26-27 June, Sisulu attends a secret ANC/NCC meeting at the congress offices in Johannesburg. 1 August, Sisulu attends a secret united meeting of the Federation of South African Women and ANC Women's League in Johannesburg. Ahmed Kathrada and Ruth First also attend. 5 December, Sisulu, John Mavuso, Moses Kotane, Marks Ramitloa and Betty du Toit attend a Christmas party in aid of the high treason accused, in Johannesburg. 6, 9, 12 February, Sisulu attends a secret meeting of the ANC at Macosa house, Johannesburg, with Ahmed Kathrada. 30 March, Sisulu is detained during a post-Sharpeville state of emergency. 8 April, Both the PAC and the ANC (the latter of which Sisulu is a member) are banned under the newly created Unlawful Organizations Act. Death of Alice Sisulu, Walter's mother. 29 March, Sisulu and other accused were found not guilty on a charge of High Treason, in the special court at Pretoria, and released. 27 April, Walter Sisulu and his home at Orlando West are searched and various documents are seized, in which blacks are instigated to strike on 29, 30 and 31 May 1961. A case in compliance with Section 2 (A) of the Act 8/1953 (Instigation) is made against him. June, At an ANC Working Committee meeting, the policy of non-violence is abandoned and Umkhonto we Sizwe (Spear of the Nation, MK) is formed through the agency of Sisulu and Mandela, who are appointed chairman and political commissar respectively. Walter is responsible for framing the organizational units of National High Command, Regional Commands, Local Commands and cells. 22 July, Sisulu, together with Moses Kotane and P.P.D. Nokwe, travel through the country to rally support. August, Sisulu visits Cape Town and organized for the extension to the ANC Youth League. 6 October, Sisulu is sentenced to R30-00 or 90 days imprisonment because he is not in possession of a reference book. 23 October, Walter helps Chief Luthuli, recently announced winner of the Nobel Peace prize, deal with media attention. 28 October, Sisulu attends a gathering in the form of a party at the house of Lilian Ngoyi. He is, together with Lilian Ngoyi and Alfred Nzo, arrested and charged for inter alia 9(1) of Act 44 of 1950. The case is later withdrawn because sufficient evidence could not be supplied to prove that the party was in fact a meeting. 16 December, MK is launched on the anniversary of Blood River. The intention was to associate with the significance for Afrikaners of this historic victory by vastly outnumbered Boers against the might of the Zulu army. 7 February, Sisulu and Duma Nokwe go from house to house in Orlando, Johannesburg and rally support amongst the residents against the government's policy in respect of Bantu urban councils. 7 August, Arrested while walking down Commissioner Street, Johannesburg, Sisulu is held for 12 days for inciting the May strikes. 26 October, "Walter is the third South African to be placed under house arrest. Effectively he was imprisoned in his own home as he was not allowed to be away from his home from 14:00 on Saturday to 07:00 on Monday, and before 07:00 and after 18:00 on weekdays. When out of the house, he was still confined to Johannesburg, and precluded from any "location, native hostel or native village". 11 January, Sisulu attends a secret meeting at the house of George Xarile together with F. Van Rensburg (a shift boss from Vlakfontein mine). It is understood that Van Rensburg made bombs for Sisulu - presumably from dynamite. 20 February, Sisulu attends a secret ANC meeting of the Phomolang branch. 4 March, Sisulu is sentenced, in the Johannesburg Regional Court, to 6 years imprisonment for (1) under section 3 (1) (A) Act 8/53 - 3 years imprisonment. Sisulu appeals, but bail is refused. 9 March, Sisulu is released on R6,000 bail. 26 March, Sisulu attends an ANC party in Dube Pokaso. The party is held in aid of strengthening ANC funds. 3 April, Sisulu placed under 24 hours house arrest. 19 April, While awaiting the outcome of an appeal against a 6 year sentence, and thinking that jail was inevitable, Sisulu forfeited R6000 bail and went underground. Security Police visit Sisulu's house and find that Sisulu has fled. 20 April, The Rand Daily Mail reports that Sisulu has fled to Bechuanaland. 22 April, The Transvaler reports that Sisulu has not yet arrived in Bechuanaland. The Star, however, alleges that Sisulu has been seen in Bechuanaland. 24 April, The Pretoria News alleges that Sisulu had arrived in LorenÁ‡o Marques, Mozambique, on the 24th of April 1963 according to a press report in the L.M. Newspaper. 30 April, Sisulu is in Lobatse. 26 June, Sisulu speaks on "Freedom Radio" and urges the youth to join forces and continue the struggle to fight for freedom. 11 July, Sisulu, Captured at Liliesleaf farm, Rivonia and arrested under Section 17 Act 37/1963 (the 90 day detention law), Walter is offered freedom during interrogation in exchange for information. He did not. Sisulu and the rest of the "Rivonia group" were held in solitary confinement for 88 days. 9 October, Walter Sisulu, Nelson Mandela, Govan Mbeki, Ahmed Kathrada, Rusty Bernstein, Dennis Goldberg, James Kantor, Andrew Mlangeni, Elias Motsoaledi, Ramond Mhlaba and Bob Hepple (The Rivonia Trialist) are charged with sabotage and attempting to overthrow the state violently. 15 December, Sisulu's appeal is dismissed by the Transvaal section of the Supreme Court.Sisulu must serve his 6 year prison sentence. Sisulu's wife Albertina placed under banning orders (remains so until 1983). 12 June, Conclusion of Rivonia trial. Furtherance of the aims of a prohibited organisation (The Communist Party of South Africa and the ANC). That night they were flown in a military plane to Robben Island. Albertina was left to rear her and Walter’s five children, plus her late sister's two children, on her own. April, Mandela's letter to Minister of Justice demanding release of poltical prisoners. When Sisulu was imprisoned in the 1960s, he began leading the first structured political discussions, which were held while the prisoners worked in the lime quarry. Here he also lectured on the history of the ANC. In the 1970's Walter's informal lectures on the ANC formed the major component of a fully-fledged course of study known as Syllabus A.
Sisulu's son Zwelakhe joined Rand Daily Mail as cadet. 13 June, Sisulu's daughter Lindiwe detained. Sisulu's wife Albertina is diagnosed with diabetes. Sisulu writes to Minister of Justice protesting against Lindiwe's continued detention. May, Sisulu's daughter Lindiwe released from prison. June, Sisulu's daughter Lindiwe goes into exile. 29 July, A prisoner in the isolation section at Robben Island is caught in possession of an exercise book in which notes were made of the history of the so-called freedom struggle. The documents are referred to a graphologist of the SA Police who, on 17 August 1977, certifies that the documents had been drawn up by Sisulu and Mandela. 1 January, The study privileges of Sisulu and Mandela are permanently withdrawn. 9 December, Sisulu's son Zwelakhe married Zodwa Mdladlamba. Sisulu's son Zwelakhe sentenced to 9 months imprisonment in Thami Mkhwanazi trial. April, Walter Sisulu was admitted to Groote Schuur hospital in Cape Town for a ‘routine medical examination’. In the same month Sisulu, Mandela, Raymond Mhlaba, Andrew Mlangeni and Wilton Mkwayi were moved from Robben Island to Pollsmoor prison in Cape Town. Later they are joined by Ahmed Kathrada. Sisulu is visited by Zwelakhe after UDF launch. Sisulu awarded honourary degree from University of York in Canada. January, Sisulu is thoroughly examined by a specialist physician, Dr. Dawid Le Roux. Sisulu is declared healthy except for the normal infirmities of old age and that his left eye is very weak. Offer of conditional release is rejected. April, Walter writes letter to Lindiwe about Matanzima's release plans. Sisulu visits with Mandela who is ill.
Sisulu has discussions Mandela regarding meetings with government. Govan Mbeki is released and their is speculation over Sisulu's release. 18 May, Sisulu celebrates his 75th birthday. 15 October, After 26 years in prison, Rivonia trialist’s Walter Sisulu, Ahmed Kathrada, Andrew Mlangeni, Elias Motsoaledi, Raymond Mhlaba and Wilton Mkwayi, were released along with Oscar Mpetha, the veteran ANC and SACP Cape Leader, and Japhta Masemola, a PAC leader. Their release was greeted with scenes of wild celebration around the country. Sisulu plays a crucial role in the 1990-93 negotiations between the South African liberation movements and the incumbent Nationalist government and does much conflict resolution. Elected ANC Deputy-President to avoid a potentially divisive contest between Thabo Mbeki and Chris Hani. August, Visits Singapore, Australia and Mauritius with Albertina. Later that year they visited North America (7 major Canadian cities and New York, Washington, Atlanta and Boston). Made Chancellor of the University of Venda, a duty he stretched to fulfill. 8 January, In Bloemfontein, Walter Sisulu is awarded the Isitwalandwe Seaparankoe, the ANC’s highest honour, for his contribution to the struggle for liberation. September, Addressed the 10th Non-aligned Summit in Jakarta, Indonesia, appealed for continued pressure on the existing government in South Africa. October, Sisulu visits China, Taiwan and South Korea. Ill health forced Sisulu to retire from active politics, but he remained active in the ANC after his term as deputy president ended. April, South Africans enjoyed their first ever free and fair elections and overwhelmingly elected the ANC to government. With millions of their comrades, Walter and Albertina Sisulu celebrated the convincing electoral victory of the organisation to which they had devoted most of their lives. May, Reunites with Father Trevor Huddleston on the latter's return to South Africa. 17 July, 50th wedding anniversary of Walter and Albertina. Walter travels overseas for his last time. He and Albertina make fundraising trips to the USA and Ireland and the UK on behalf of Education Africa. 15 July, Sisulu is awarded the Padma Vibhushan, one of the highest civilian awards of the Republic of India for exceptional and distinguished service in fields of human endeavor. He was awarded this for his struggle against apartheid and was the 4th non-Indian citizen to receive it. Albertina and Walter leave parliament for the last time and retire from politics completely. The Congress of South African Trade Unions confers a special award on Sisulu in recognition of his role in the liberation struggle. Walter and Albertina Sisulu: In Our Lifetime, a biography by Sisulu’s daughter-in-law Elinor, is launched by the Nigerian poet Ben Okri, who also wrote the tribute for Walter’s 90th birthday. On the way to bed that evening, Walter collapses and dies in the arms of his wife.